TAICHUNG CITY STADIUM. 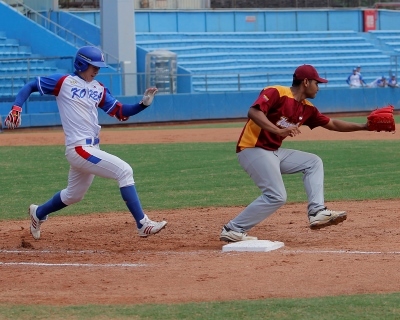 Korea clinched fifth place at the XXVI 18U Baseball World Cup with a 6-1 victory over Venezuela on Sunday afternoon at Taichung City Stadium. They sealed the win in style, converting a triple play to end the game. Korea didn’t waste any time and took a quick 1-0 lead in the first thanks to a throwing error of Venezuela’s center fielder Yonathan Oliveros. They added two runs each in the fourth and the sixth to increase the advantage to five runs – Byung Ok Bae had a couple of RBI singles – until Venezuela got on the board in the top of the seventh. Nelson Torres walked with the bases loaded to break up the shutout bid. But it was too little to change the outcome of the game, as Korea even tagged on another insurance run. The highlight of the game came right at the end. Anthony Concepcion and Silfredo Teran singled to lead off the frame to put runners on the corners. Teran was removed for pinch runner Juan Vegas. Oliveras stepped to the plate and hit a groundball to third base. Ha Seong Kim, Chan Ho Park, Byeong Wuk Lim and Joong Yeol An converted 5-4-3-2 triple play to finish off Korea’s 6-1 win.